Is your electric oven not heating? I have an oven that does not heat. The stove top heats, the lights work, and the oven controls work but the oven is not heating. I have tried everything. Everything works EXCEPT the oven will not heat. Does this mean the bake and broil element went out at same time? Please help I need to cook for 9 people in the next week. BTW I have a Kenmore Electric Range Oven. Thanks for any help you can give! If everything is working properly BUT the oven, it usually means that the baking element and the broil element are intact and working. The issue is most likely a bad internal fuse, oven temp sensor, thermostat, a broken/frayed wire, power issue, or an oven control board. NOTE: Electric ovens use two different electrical circuits. The heating elements use 220 volts. Most everything else including lights, timers, and rotisserie motors run on 110 volts. You may have been only trying to BAKE and not BROIL. Try and turn the range on to BROIL and see if it heats. If it does BROIL, then you have a wiring issue, thermostat problem, or a broken BAKING element. Visually inspect the baking element for any parts of it that may have pitting, burn marks, or roughness. Remember the broiling element is the top one and the baking element is the bottom one. Most of the time the baking element in your oven goes bad and not the broiling element. If the 4 top cooking element burners are getting power and working (getting hot) then you know the range is receiving the correct voltage. Depending on what manufacturer and model range you have (GE, Kenmore, Maytag, Magic Chef, Frigidaire, Amana, Bosch, LG, Viking, Whirlpool, KitchenAid) your range may have a bad safety thermostat that may cause the baking element or broil element to not receive power therefore it will not provide heat. If an element fails (whether it be the bake or broil) the outside of the coil may look and feel rough and bumpy. If you find an area on the element like this the best thing to do is replace it. First disconnect power to the range. Remove the cover on the back of the range. Check the wire that runs from the control panel to the bake element. Check the wire that runs from the control panel to the broil and bake elements. Get an ohm meter and disconnect one wire from the bake element. Check the resistance of the element. Both the bake and broil elements should be 15-30 ohms resistance. If the elements are not in this ohm range, replace one or both. If you find that both the broil and bake elements are in working order, then you need to check the thermostats, the wiring that goes from the controls to the elements, and any type of fuse that your oven/range has. Also check the electrical cord, plug, and the wiring that goes from the cord into the oven. 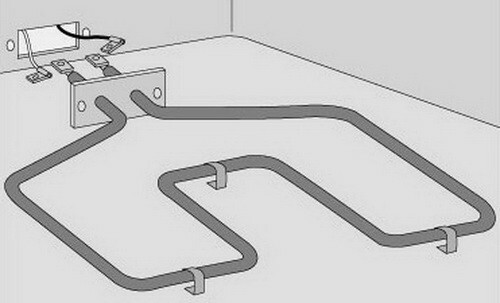 Be sure all wiring is secure and not loose. 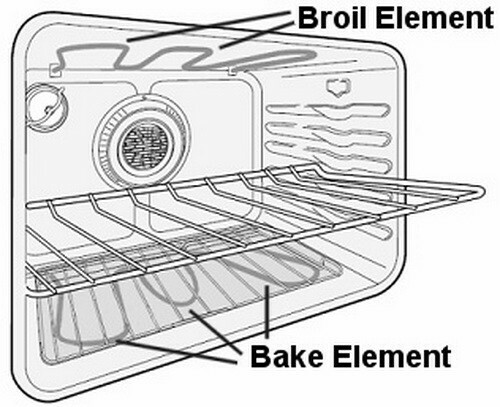 Inspect to see if any of the wires that go to the bake or broil element are not burned, frayed, or damaged in anyway. 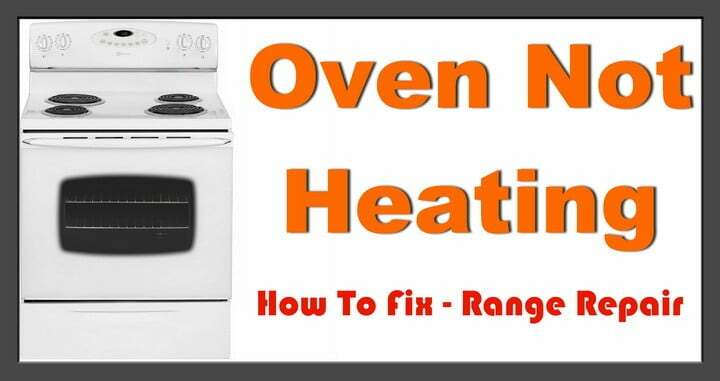 Below are some videos to help you troubleshoot why your oven will not heat and how to fix the problem. Oven Won’t Heat or Not Working? Oven won’t heat, won’t bake evenly or won’t turn off or on? This video shows how to test a bake element and or a broil element on an electric oven. The bake element and the broil element are the most commonly replaced parts for an electric oven that is not baking properly. If you have questions why your oven will not heat, please leave a comment or question below and we will be happy to assist. I have 25 year old Kenmore stove, I burnt out a fuse for the oven. 30 amps. I purchased new fuses, a T type fuse(time delay) which burnt out right a way. I also tried a P type fuse, this fuse did not burn out, (so based on this, I thin I do not have a short), However, The oven burners do not heat up. Both oven and broil have been working. The fuse first burnt after I had been using the broil. I turned it off, and then turned(quickly) back on and fuse burnt. Any ideas on if it is a “oven rated” fuse out there? and were I can find one. I have a Kenmore double wall oven model 790-48879901. The bottom oven works great but the top oven quit. We have checked the continuity of the heating elements both are fine. We checked the continuity of the thermostat fuses and the fuses are getting continuity. Sears is insisting that it is just a fuse but would the fuses get continuity if they were bad? I have a Kenmore stove, the question is my bake element is out and my broiler element works. Is it safe to used the broiler element for the bake element until I receive my replacement for the bake element. I have a Maytag electric oven model MER5765RAW. Initially it would not bake or broil higher than 100 degrees. I noticed bubbling and a crack on the lower heating element. I have changed the upper and lower heating element, I figured I would just change them both. They still did not heat up after changing. The digital display only read 100 degrees still. The clock has updated the time and the stove still cleaned itself, but the oven did not heat. I am now about to change the sensor. Is there something that I am missing? I dont have an ohm meter but I am searching where I can buy 1. I am restoring a 1962 Imperial Frigidaire Range model #RI – 55-62 and the bottom heating element is bad. Do you have an info on what part # would be used to replace it? i have a frigidaire stove model FEF366CQE neither broil or bake elements are working but when turned on both have 125 volts on each connection. checked temp sensor ohms at 1070. can you help? Hi Karin, I have exactly the same problem with my GE Oven. Everything looks good but it doesn’t heat the elements. If you find out what’s wrong with your GE Oven please let me know thanks. I have a kenmore double oven (apparently made by Electrolux) and every time I clean them (one or the other) that particular oven does not heat up. I have had the thermal fuse replaced several times and Sears does not stand behind the product. One of their technicians said to not self clean them but to use Easy Off (why have a self clean oven) These particular ovens are not quite 3 years old. I have an oven that sometimes preheats completely and other times not at all. The bottom element seems to be working some of the time. The top element seems to not broil..
Do both elements need to be working to get to your set temp? The range portion works fine. I have a kenmore electric range and the oven will not heat over 350F, in order to get 350F I have to set the key pad to 550F, which is the max setting. Can you tell me what is the problem. I have a Jenn-Air/Maytag Electric Range Model SCE30600. The oven heating elements stopped heating although all four burners work. Neither bake or boil heats up. No visual damage to the elements. As we rarely use the boil element, nor the bake element frequently, this looks to be an issue outside the heating elements. When I set the bake temperature to 350F, the fan starts as expected, the bake indicating is on on the control display, however the preheating display stays at 100F which is the initial temperature, the heating elements remain cold. My oven won’t heat. I’ve checked the elements which are at 20 ohms each. The bake and broil relays are latching and I’m getting 120 volts on each side of the elements. I’m just not getting any heat. I have a Maytag Performa Stove PER5750QCW. The bake stopped to heat, but broiler and the heating element on the top are functioning correctly. When I setup a temperature like 350F, this temperature cannot be reached (I can hear the tic tic of the panel control but nothing happens). The bake element looks fine but remains cold, just the broil element is slightly heating. The continuity of the back element is ok (about 19 ohmes), also the broil element is 16 ohmes and it works properly. The sensor is also correct (about 1110 ohmes). Also no wires damaged at visual verification. The control panel looks normal. Is it safe to plug the broil element into the bake element plug to confirm that the bake element is broken and not other things related to? Any body has a suggestion? You can try swapping the bake element and the broil element for troubleshooting purposes. It should be safe to perform but use extreme caution. You checked ohms on the bake element and seems to check good, did you do a visual to be sure there are no burnt spots? Is the wiring in the back of the oven going to the bake element in perfect condition? No damage or loose wiring? Usually the issue you are describing is the sensor but… A good sensor will have 1100-1300 ohms at room temperature. So it seems you checked it and it is in the proper range. Both elements seem to be working as you have shown. There may be a shorting wire that may cause the bake element to not heat. There may also be an issue with the control board, it may be making the clicking noises like it is sending power to the bake element, but it may be faulty. Do some further troubleshooting and if all components test good or in the proper range, you may want to change out the control board. My oven stopped working. The surface burners work but not the oven. We checked the continuity of both the baking and broiling elements as well as everything on the back panel. Everything is getting power to it but still the oven still isn’t working. It’s a 5 yr old Kenmore model #709.90119011 What could be the problem? If neither the broil or bake will work in your Kenmore Oven, and you know they are in good working order, the problem is usually a thermostat, broken wire, or the oven control. I have a Kenmore wall mounted oven, model 911.47629100, and I noticed it was not heating properly. So I placed an over thermometer inside it, one that hangs from the rack. When I set the oven to a given temperature, it will beep at me as being ready, but the inside thermometer will show that the temperature is anywhere from 25-50 degrees below what I set the oven to be. I used to be able to wait five minutes for the reading to match the setting, but now, I have to wait 10-15 minutes. Yesterday, when I cooked something in it, I waited until the inside temperature read what the cooking temperature should be, and I placed the item in the over for 26 minutes, according to the directions. When the 26 minutes were up, the food was cooked properly, but the inside thermometer read a temperature 25 degrees above the desired cooking temperature. What can I do to get this oven to heat properly? BTW, this model has two ovens. I have been using the top one only. We have some baking sheets and pans stored in the bottom one. We have not had the need to use both. Most likely a bad thermostat will cause an uneven temperature in your oven. Check to be sure the thermostats are working properly or replace them and this should fix your “not heating enough” issue. My OVEN made a popping noise and bake and broil didn’t work. I took off the back and saw a burnt wire to the baking element. I replaced the terminal on the wire, turned the stove on and the baking element worked but the broil didn’t work. When I turn on the broil the bake came on. Check the wiring to be sure it is wired correctly. Do you have a schematic that should be located on the back of your oven? If so use it to help you trace the wires from the controls to the broil and bake element. What make and model oven do you have? I have an Amana range with the glass top. It is a self cleaning range. Every since I did the self cleaning cycle, the oven (broil or bake) and none of the burners will not work. I noticed after the fact that there is a sticker inside near the oven door that says “Important…remove racks before self cleaning”. I did not do this. So I am wondering if you think I can fix the problem myself or do I need to trash the range. 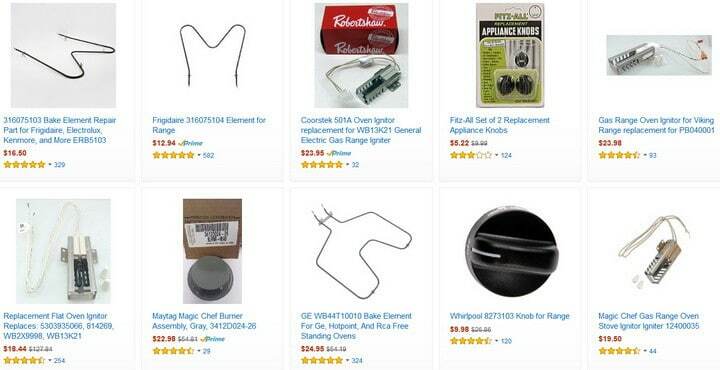 I’ve been looking online and I wonder do you think I need a new oven sensor or is there a fuse for my range. The model is ARTC7511WW. If the oven does not work after self cleaning, then something most likely electrical is faulty. Use a meter to find out if the range is getting the proper power. If so test the fuse to be sure it is not blown. If not then you may have a bad sensor or a wiring issue. Further troubleshooting is needed.